Why Attendance and Chronic Absence? How Can We Deliver the Message? How Can Educators Improve Attendance? How Can We Engage the Community? How Can We Identify & Help Students with Poor Attendance? How Can We Measure the Impact of our Attendance Awareness Month Activities? Help parents make the connection between absences and academic trouble through conversations in the community and by building a welcoming environment at school, in letters sent home and in parent-teacher conferences. PTAs or other parent-led organizations can develop programs to educate parents and help families with barriers to attending school regularly. Business owners can talk to employees about the value of attendance. Community agencies and volunteers can help get the word out even before school starts. The Positive Parent Messaging Toolkit is for helping teachers and schools deliver the right messages on attendance. 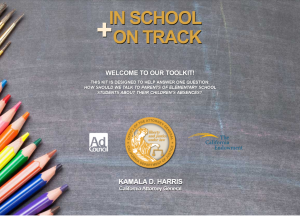 Developed by The California Attorney General’s Office, the Ad Council, and the California Endowment, the toolkit includes research, communication tools, and recommendations for district and community leaders. To gather input on messaging the Ad Council interviewed nearly 1,000 parents of chronically absent elementary school students. Created with the help of practitioners who have worked successfully with families to improve attendance, the toolkit and video are filled with ideas, activities and materials that you can use to spark conversations with parents. The Student Attendance Success Plan is designed to help parents track their children’s attendance and work with teachers to set appropriate goals. You can find the four plans below by clicking here.